Work on a flat surface, preferably waxed paper. Spread butter on one side of all four slices of bread. Flip them over and spread 2 slices with marshmallow cream, the other two slices with chocolate hazelnut cream. Place the slices of bread with the buttered side down in a hot skillet or griddle for a minute, or until they brown. Remove them carefully using a spatula, and place on serving plates. 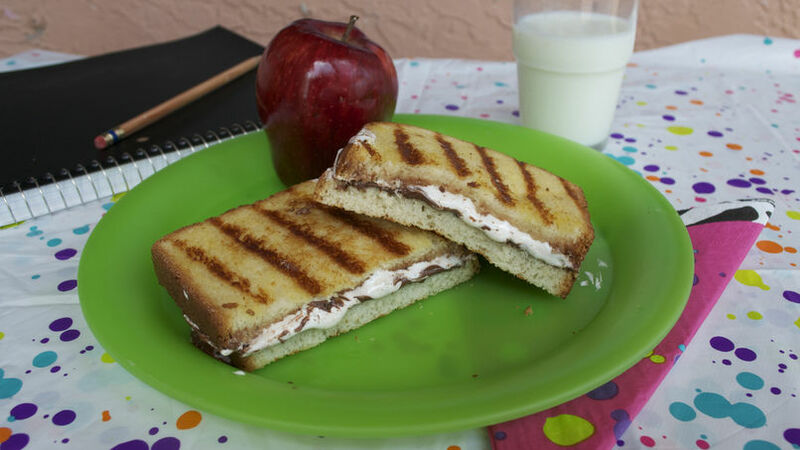 Join a slice of bread smeared with chocolate and one with marshmallow to make the sandwich. Don't press the layers together too much or the filling will ooze out. Let stand a minute. Carefully cut the sandwich in half diagonally, preferably using a serrated knife. Serve warm with a glass of milk. Preferably use slices of Challah o Brioche bread, they have a better consistency. Cook the slices separately if you can, but if you want, you can make the sandwiches and then cook on each side until it browns. As moms, we're always a little anxious when it comes to our kids going back to school. And I'm sure you want the same as I do for them; to give them a great breakfast to start the day and creative and varied lunches to take to school. It's equally important to give them something special when they do well in their classes to keep them motivated. Here's one of my secret weapons that has served me very well with my girls. It's my take on the classic s'mores, a beloved snack in the U.S. and a must-have food during camping trips or around bonfires. A s'more, of course, is a combination of chocolate and marshmallow melted between graham crackers. My recipe is a grilled s'mores sandwich that you can make in the comfort of your kitchen on the grill. Instead of crackers I use sandwich bread, which I fill with chocolate and hazelnut cream and marshmallow cream. Pair it with a glass of milk for an irresistible combination!